“Are You There God? It’s Me, Margaret.” Anyone remember this book? It was in your middle school library. Truuuuust me. It was there. Full of tween angst, heroine Margaret encounters such trying obstacles as struggling to fill out her bra, getting her first period, and learning how to use pads (those suckers had belts on them way back when. Belts!). We look back at these kinds of issues now as silly and juvenile, but remember when they were real? These were actual problems we mulled over and agonized about? And—just like in the book—in the end it all worked out: We grew up, became women, handled the issues of womanhood as routine matters, and all that worrying way back when was for nothing. Well, I feel like Margaret. Two-fold. I feel like Margaret in the same way that, one day, in a land far, far away, this infertility struggle will be something I’ll look back on in the same way I look back on my unfounded worries about puberty. I will see infertility as something that was handled. Something that was overcome. Something I no longer have to struggle with. Something that had a happy ending. And I feel like Margaret in that the cry of my heart right now is the same as the book’s title: Are You There, God? It’s Me. Except my name’s not Margaret. And my issue feels bigger. And heavier. And its solution intangible and completely out of my control. I prayed and DH prayed, and DH and I together prayed, over my follicle situation. We’ve been praying since we found out about it on Saturday. I’ve been standing on the scripture in Psalm 113:9: “He makes the barren woman to keep house and to be a joyful mother of children.” We went in to today’s ultrasound expecting. Expecting to see growth, expecting to see more follies released, expecting good news. Dr. F, who was surprisingly cool today, said there’s now seven follies and not eight. I have no idea where a follicle goes when it disappears, or that it is something that can even happen in the world of follicles. Of the now-seven, three look okay-ish. The best contender is measuring at an 11, which is up one from Saturday. The two backups are measuring at 9 each. As for the remaining four follicles, Dr. F doesn’t think they’re going to be mature enough for retrieval. I felt deflated. Completely taken aback. This is not what we prayed for. This is not what we’ve been believing for for two days. This is not what I expected. Because Dr. F is not my treating physician (the only reason I’m seeing him is because he’s the on-call doc during this long weekend), he usually doesn’t want to tell me his medical opinion in detail until Dr. C clears everything. So when I asked him whether Dr. C was going to bother with a retrieval for me for one or two measly eggs, I couldn’t get a straight answer. He vaguely alluded that Dr. C might. Or he might not. Who knows! It’s only my body we’re talking about here! There’s still a chance the smaller guys could catch up and that I’d end up with three mature eggs here. I’ll likely trigger on Friday and have retrieval on Saturday, so I have a few days still. Someone needs to tell my ovary that, though. In fact, someone needs to remind it that it’s being blasted with meds right now and to wake up from its slumber and get in gear. So I took that job upon myself! For the past few days I’ve been making myself visualize in order to help my mind connect better with my body. Not like all day long, just a few times a day and when I begin stressing. I envision pristine, perfect, shiny, awesome, round eggs. I imagine these flawless eggs tucked lovingly into my ovary, patiently awaiting the day the doctor carefully removes them to start them on their journey toward embryo-hood. Hey, whatever works. I go back to the clinic in two days for follow up u/s. In the meantime, my Menopur has been upped again, this time to four vials. This means I must order more Menopur from the pharmacy to get me through to the retrieval that may or may not happen. This medication is expensive. It doesn’t seem to be working. My insurance doesn’t cover it and I’ve already used my Compassionate Care coupon, so I can’t get another discount. Oy. I refuse to give up hope here. It only takes one. One! That’s all I need. And finally, I didn’t know where to fit this part in to the post, but I couldn’t let it go completely, so consider this just the random paragraph tacked onto the end of this post. DH and I went to the art museum yesterday to kill some time and get out of our heads about IF. 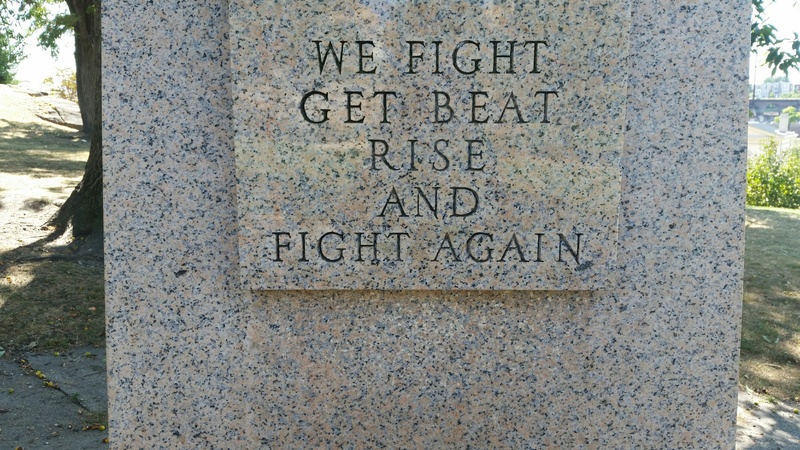 I saw this plaque beneath one of the statues outside in the park that backs up to the museum. It reminded me of this infertility journey that I and many of you are battling through, and I absolutely wanted to share it here. Ugh im so sorry! I love what a fighter you are being and keeping the faith. I also love that verse too. And you are right..it only takes one!! Praying for u and those follies. Thanks! I have that verse taped to my bathroom mirror now! I thought you could use a Rocky quote right about now. Because really, when can one ever not use a Rocky quote? But seriously, though. Keep fighting, girl. Keep moving forward. I still have big hopes for those follies. The 9s are only 2mms behind the 11. That’s nothing! Also, if it were me, I would email doctor C tonight and ask him if he plans on proceeding to the retrieval, and explain to him that you don’t want to have to re-order expensive $$ if he’s not. The doctors are usually pretty good about responding to email, at least Dr. G usually was. Because eff that. I would hate for you to order stuff and then him be like, nope. And you could also just ask him to call you and talk this over. I think after talking to him you will feel better no matter what. Getting crap news from another doctor is the worst. I’m sorry you are going through this. I really am. These are crappy times, no doubt about it. But you will get through this. You will. And all of your struggles are going to make you an amazing mom. I am certain of it. Thanks! What an appropriate quote, especially since I was at the very same steps Rocky ran up just yesterday lol. Yeah, I plan to call them tomorrow and ask for an ASAP callback so I can have enough time to call the pharmacy if needed. Oh good luck with everything. I pray that these obstacles that are placed in our ways are nothing more than God’s way of preparing us further, ripening us up so we can be ready for the roads ahead. I love the quote about fighting. It is so important to remember you’re not out until your out and even then you get back up. You are in my thoughts girl! I hope that everything works out for the best =) Keep me posted!